That flattop is awesome and I don’t see how it could fail to make anyone smile. It was pretty nice of Craig to write this script for the Upcoming American Salvage comic, not only because we gave him about 6 seconds notice that he was getting a page in the book, but also because last year he published an entire comic book about the history of Portage Printing (I drew 3 pages for him) and it’s sort of amazing that he still had any material left over. I thought he might have some kind of clever advertisement in his back pocket, already prepared, but he managed to come up with an original story that ties back into the “salvage” theme of the rest of the book. I’ve never been to Portage Printing: when I lived in Kalamazoo I had a 500-page a semester copy code from the university, plus I got one of the secretaries to give me an unlimited code so I could secretly make copies of my 600-page novel in the middle of the night. However, I suspect it’s a top-notch place. Craig has really created an amazing business model, combining an obvious passion for professional excellence with the unforgettable marketing device of filling his workplace with old-timey artifacts. If you happen to be in southwestern Michigan and need to print a comic book or something like that, I highly recommend checking his place out. Craig sent me some of the source images, and his loyal customers provided some others via the Portage Printing Yelp page. This entry was posted in comic and tagged anachronism, business, color, comic, printing, technology on February 1, 2018 by littledragonblue. Seriously, do you remember life before wi-fi? Before dialup? Were we truly even alive? In some ways the internet is making us all stupider. We don’t have to remember things, because the internet remembers them for us. We don’t have to search for things; the internet does that too, which means we miss out on all the things we would have learned if we undertook our own, more arduous searches. The internet supports the rise of a lowest-common-denominator culture where there are no gatekeepers and anyone can publish anything, so the authority of the average piece of writing can never be assumed. Also, it’s destroying our ability to focus and concentrate. And it’s probably wholly responsible for the rise of white supremacy in America and the election of the current president. But also, the internet brings us everything: new friends, old friends, music, movies, books, games, homework help, advice, cat pictures, instant news, school, an easy cheat to “6 Degrees of Kevin Bacon,” and the basic sum of all knowledge discovered by our species. Can you imagine going back? I don’t want to go back, anyway. Not if I can’t telecommute, digitally spy on people from my past, instantly discover the answer to almost any question I might have about the world, share my art with 1000s of people minutes after I complete it, and chat, for free, with anyone, anywhere, any time, in a format that allows me to also do 50 other things without the person I’m chatting with having any idea what percentage of my attention is focused on the conversation. Despite its drawbacks and abuses, I’m grateful for the internet. This entry was posted in gratitude, Uncategorized and tagged connection, grateful, gratitude, internet, technology on May 23, 2017 by littledragonblue. Can you believe that there are otherwise sensible people who don’t “believe” in public libraries? Yeah, this seems crazy to me, too, but these people exist. They use arguments like, “I can get any book I want on the internet” and “Google is faster for research.” Never mind that fact that some people can’t get any book on the internet, because, just like the people for whom public libraries were originally constructed, they can’t afford that technology. Never mind the fact that search engines prize popularity over objectivity and readability over depth, delivering so many fast results that you could spend the rest of your life sifting through all 1.58 million of them, without necessarily finding the results you needed. Besides the primacy of facilities available to anyone who wants them, staffed by professionals trained to discover, curate, and deliver reliable content, libraries serve as public meeting spaces, classrooms, clubs for nerdy kids, safe spaces for those with terrible homes, and temples to knowledge. Many people couldn’t get jobs, or tax information, or any one of hundreds of things most of us take for granted, if they didn’t have access to library computers. As more and more common functions become more online (typically making them more difficult to access in meatspace) libraries allow those without computers to simply participate in their own culture. My property taxes are somewhat itemized, so I can see that, last year, I paid $50 toward these services. That’s $50 for 1 year. I pay more than that for one month of internet service at my house. And you can have all the internet you want at the library. Even when it’s closed; in my town, library networks are strong enough that you can park your car in the street near the library and get online. That’s on top of all the other things you get inside the library when it’s open. And that $50 doesn’t just get my family and me through the door. It helps keep the doors open for everyone. If you want to stand up and say that you don’t believe in libraries because you think a certain percentage of the population shouldn’t have access to information, good luck with that argument. Obviously, there are people who will wholeheartedly agree with you, but I assume these are the same people who don’t believe in public roads, or public police forces, or public fire departments. At this point in human history, access to information should be considered a human right, like clean air and fresh water, but, of course, there are people who don’t want you to have those things either. And if they can keep you out of the library, you might not even know that you have a right to those things. So, all hail the public library. I am grateful that you continue to serve as a sacred hall of knowledge available to all who seek it. This entry was posted in gratitude and tagged books, grateful, gratitude, internet, library, technology on May 9, 2017 by littledragonblue. Remember when you were a kid and your could ignore anything? Vampire Bat fits into the scope of this comic, I think, and creates a nice contrast to some of the other characters. I could probably draw a better bat, but I’ve been sick and frankly I don’t even really remember drawing most of this comic, which I apparently did in the middle of the night with a mild fever while watching 3 episodes of The X-Files on Netflix, which I also don’t remember. Thank you subconscious mind. Way to be way more functional than my conscious mind, even if you do keep it all to yourself. In panel 4, the girl is, of course, rocking out to Taylor Swift. They really do like those big headphones, which are a lot more comfortable than earbuds. As adults, it’s sometimes hard to know how to handle kids and technology. We don’t want them on their devices all the time, but we also don’t want them constantly complaining that they’re bored. We don’t like hearing the random sounds their devices make, but we also don’t like them being completely checked out and unable to hear anything you say to them because they’ve got the headphones on. 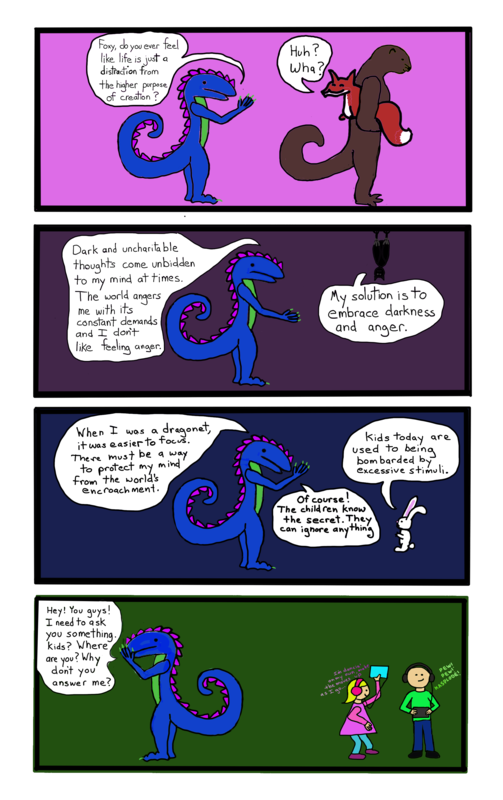 This entry was posted in Comics, Dragons and tagged anger, comic, devices, dragon, fox, ignore, kids, otter, rabbit, technology, vampire bat, webcomic on October 6, 2014 by littledragonblue.